As I’ve mentioned here several times before, I have a soft spot for one of the DC area’s unique food items. Indeed, you can read my previous treatise on DC’s most notable item, the half-smoke. 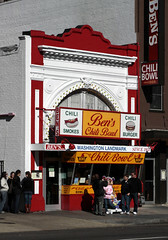 But, after reading that and some of the comments I received from both my readers here and on flickr, I realized I’ve been amiss in visiting the mother of all half-smoke joints: Ben’s Chili Bowl. Ben’s Chili Bowl is an institution. Located on U Street right across from the U St/African-American Civil War Memorial/Cardozo Metro Stop (indeed, it predates the Green Line, and spent multiple years with a gaping hole in the street in front of the place as they built the Green Line), Ben’s has been serving half-smokes, chili dogs, fries, and such to hungry area residents through good years and bad. It is, quite simply, a landmark. Enough so that the first thing most people experience at Ben’s is the line. When we went (and most previous visits as well), the line was spilling out the door and down the alley adjacent to the restaurant. Inside was packed solid with people, with all the seats taken, requiring folks to get their orders “to go” just in case there wasn’t an open seat when your order came up (we got lucky and scored a booth, however). But aside from the crowds, it’s pure diner. 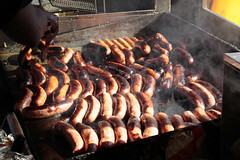 The staff is friendly but busy, slaving over two separate grills as they assemble everyone’s burgers, hot dogs, chili bowls, and half smokes. The music is going strong (and loud), with a nice selection of everything from the ’50s through fairly recent hip hop. And the signage can be fun… Bill Cosby gets to eat for free. As do the Obamas, except for Barack himself (“‘Cause Bill Cosby says so!” according to the sign). As far as the food? As far as I’ve been concerned, there’s one thing to order at Ben’s, and despite it being called Ben’s Chili Bowl, that’s not what you order. You order a half-smoke with chili. Although virtually every little street cart in DC carries half smokes, Ben’s has a half-smoke that’s a grade above most of the carts, with an even coarser grind, more spice, and just a little more heft. 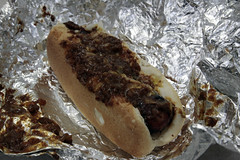 Topped with the chili, it’s a good, solid, version of the DC classic with just a bit more bite and flavor. The chili is also good, as are the fries (and, due to a miscommunication, ours came with chili and cheese on them, making this trip a complete chili overload), but if you don’t do the half-smoke, you’re missing out. Alas, the founder of Ben’s Chili Bowl, Ben Ali, died back in October. His memory lives on, however.